Blindly ad-libbing his way through a talking-points script (as opposed to written dialogue) full of already dated pop-culture jokes ("Woop, there it is! "), Will Smith provides the voice of Oscar, a shallow, bottom-rung tongue-scrubbing fish at the local "whale wash" whose entire life revolves around his forever failing schemes to get "rich and famous." He's so self-centered that when the doormat girl fish who loves him from afar (Renee Zellweger) loans Oscar an antique pearl to pay off 5,000 clams in loan-shark debt, he takes the money to the racetrack and loses it all on a long-shot seahorse. But just by chance this worthless hero-by-default finds himself in a position to pretend he killed one of the mobster-like Great Whites that forever threaten the reef. He's soon swept into the celebrity world he's dreamed of -- succumbing to the charms of a gold-digging, Jessica-Rabbit-rip-off femme-fatale fish (Angelina Jolie) -- and failing to realize the next time sharks come around, he's going to have some explaining or some fighting to do. His only hope is a ruse he concocts with Lenny (Jack Black), the wimpy, ironically vegetarian son of the Great White godfather (Robert De Niro, of course). Lenny is sure "my dad will never accept me" because of his non-carnivorous lifestyle and agrees to stage his death at Oscar's hands so he can disappear and begin a new life -- humorously disguised as a bottlenose dolphin. 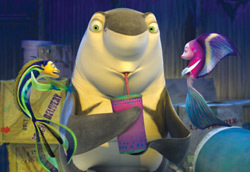 What little creativity "Shark Tale" has to offer goes into its amusing incidentals (Martin Scorsese's voice gets heliumized whenever the mob-lackey puffer fish he plays balloons up from stress). The larger balance of the movie is nothing but tired old plot elements trotted out in predictable fashion -- the worst of it being that Oscar spends the entire movie behaving as a stereotypically narcissistic, oblivious-male braggart, but gets his happy ending with one of those worthless last-scene apologies to the ego-battered girl he's mistreated throughout the picture. But, you know, it's just a kids' movie, right? So why bother putting any effort toward originality or providing messages other than "guys are jerks, get used to it"? Kids are too dumb to know the difference, right? Well, Pixar's CGI-cartoon feature films are "just kids' movies" as well, and yet somehow they manage to come up with inventive, yet unforgettably heartwarming stories -- not to mention superior animation. So if it's underwater animated amusement you want, skip "Shark Tale" and just watch "Finding Nemo" again.